Fetch is a fun game to play with any dog. It involves throwing a ball or another toy and having your dog chase it then bring it back to you. Many people think this game is something dogs do naturally. However, most dogs actually need to learn how to do it, or at least some part of it. Fortunately, it's not difficult to teach your dog to fetch. Before you do anything else, make sure your dog has a good understanding of the sit command. All games of fetch should begin with you asking your dog to sit. Make sure it's sitting calmly next to you before moving on to the next step. This ensures that once the dog understands the rules of the game, it won't jump up on you to try to get the ball before you get a chance to throw it. Once you get your dog to sit, throw the ball and tell it "fetch." Start off by throwing the ball just a short distance. Most dogs will instinctively chase the ball and pick it up. If so, you're done with this part of the training. If fetching doesn't come naturally to your dog, you may have to work on training it to play first. You can start off by giving the dog treats or praise for taking an interest in the ball. Then, slowly work your way up to having it run after and pick up the ball. This step and the next are the most important parts of the game of fetch. It's also the place most people run into trouble. If you can't get your dog to come back and drop the ball, you're not playing fetch, you're just playing chase! The best way to get a dog to return to you with the ball is to make sure it has a strong understanding of the come command before you begin. When playing fetch, as soon as your dog picks up the ball, say "come." Encourage your dog to come back to you by speaking in a happy voice, patting your legs, and giving it praise. If a dog is having trouble with this step, you may need to shorten the distance you throw the ball. In some cases, you will have to start with throwing it just a few feet away from you then gradually increase the distance. Your dog should be able to consistently bring the ball back to you before you move on to the next distance. It can be tough to convince a dog to return the ball to you once it has it in its mouth. It helps if your dog knows the "drop it" (or release) command. Practice that before you play fetch with your dog and as soon as it returns to you, give the command "drop it." If the dog releases the ball, give it praise and throw the ball again as the reward. If your dog will not release the ball, you need to make it worthwhile and treats usually do the trick. Give your dog the "drop it" command, and then show it the treats. The dog will have to release the ball in order to get the treats. Make sure you wait until you have the ball back in your possession before giving up a treat. Then give your dog an additional reward by throwing the ball to continue the game. Another option is to use two balls instead of treats. As soon as your dog returns to you with the first ball, show it the other ball you're holding in your hand. Many dogs will drop the ball they have in order to go after the second ball. As soon as your dog drops the ball, throw the one in your hand for it to fetch. This approach doesn't always work, however. Some dogs refuse to let go of the ball they already have. In this case, the treat method is probably your best option. Keep in mind when you're going through these steps that your dog is likely to be just as happy playing chase or keep away as it is playing fetch. Don't get sucked into a game of chase! If your dog runs off with the ball, turn your back and begin to walk away. Most dogs will run towards you. If your dog refuses to bring the ball back, end the game. For dogs who persist in running away with the ball, try practicing while your dog is on a leash. Throw the ball just a short distance, give the come command and then just stand there and wait it out. Use treats and praise to coax your dog in the right direction. Some dog trainers also use the approach of hiding a treat inside the ball. To do this, cut a small slit in a ball and insert a treat while your dog is watching. Your dog will know the treat is inside and be able to smell it, but most likely won't be able to get it out on its own. Instead, when the dog brings the ball back, you will have to get the treat out. After just a couple of throws, your dog will realize that to get the treat, it has to bring the ball back to you and drop it. If your dog does not pick up the idea of fetch right away, give it time. Be patient and consistent. If you practice a little each day, your dog will eventually figure it out. 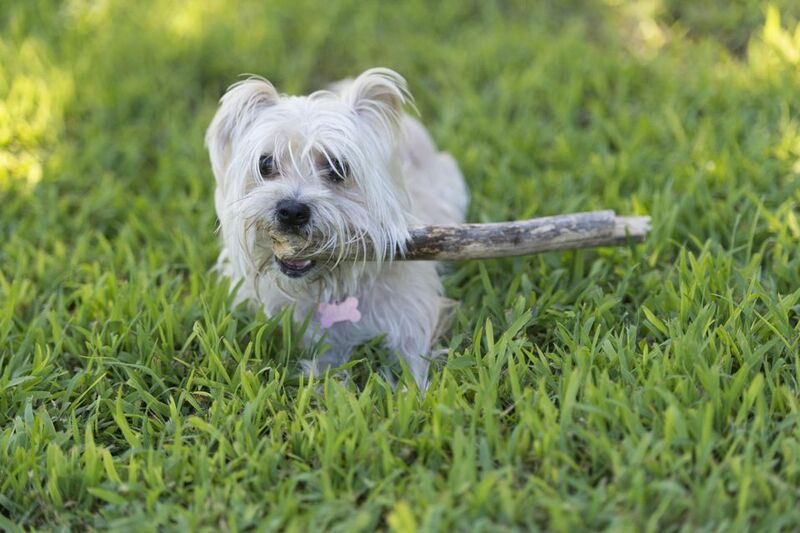 In fact, you may find that your dog becomes a fetch fanatic! Once you can successfully play the game in your own backyard, you can take it to the park and proof the behavior to see how your dog reacts around distractions.